If you use opamps like the TL082/84 you’ll be in need of a “split” power supply. 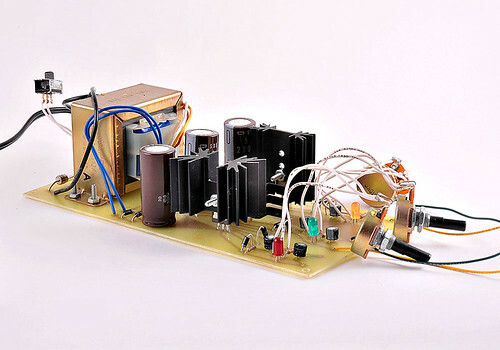 That is a power supply that has a positive voltage, ground, and the equivalent negative voltage (eg +5v, 0v, -5v). Since most audio signals are AC you need the opamp to operate in this range to be able to process them. But sometimes we only have +5v to work with (like when powering from a USB port). So what can you do…? A simple way to generate a negative voltage is use a charge-pump circuit – like this one based on a 555 timer. The timer is in astable mode, so it’s oscillating and producing a square wave. Through careful placement of diodes it’s possible to direct one transition of the square wave to one side of a capacitor. Since the capacitor only sees one side of the waveform it is “pulled” into a negative configuration. This negative charge can be tapped on the opposite plate of the capacitor. The only current available will the charge stored in the capacitor – so in other words not a great deal. But it should be enough to run a TL084 for basic signal processing – just as long as you are not trying to power a speaker or anything. The 555 timer runs relatively quickly, so charge is replenished rapidly as well. I have run the above circuit with an Arduino and been able to process simple audio signals +5v input gives -5v output. It’s worth pointing out that there are custom negative voltage generator chips available too (The MAX232 is one of them) – but this circuit is so simple and the parts are really easy to find. The following is an etch mask to make your own – 600 DPI TIFF file. 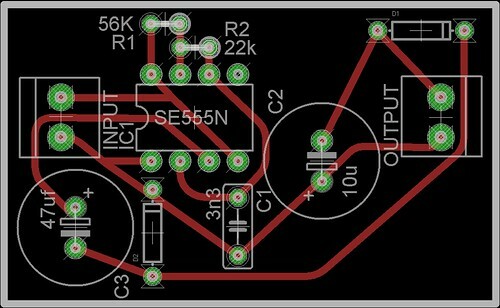 Another option is to split the 5v itself to give -2.5v. 0v and +2.5v – but you need to be sure to bias everything correctly. Nice idea. Worked with TL084 for ages to create the input /output stages to my Digital Delay Line using ‘Bucket Brigade Memory’ devices. Saves using a full wave Rect set up with a couple of +/- 15V LM7815 LM 7915 V Regs plus all the support Caps. How much current can this supply? Ballpark figure is 10ma – I’ve been able to run TL082s from it. This circuit is theoretically sound, but depending on how much current you draw and so on, you might want to worry about purely analog factors such as ripple voltage in the output. One first thing you might want to do as good practice, even if it probably won’t make any difference in this case, is to put the cap between the diode and the output, physically on the board. If you have issues with ripple noise you could also add a choke coil or a small values resistor (<5Ω) between the diode and the cap/output. Furthermore, I'd probably like to add a small decoupling cap on the input rails. So far ripple hasn’t been a problem and the output has been “good enough” to do some simple audio processing. You make some very valid points – worth looking into. BTW, I’m noticing that you have some sort of problem with Unicode on the server. My omega sign for ohms got nom’d and replaced with a question mark. Did you try ampersand-hash-937-semicolon for Ω ? I did not. I just switched to Greek keyboard layout and typed the character. Which version of MySQL are you(r host) using? 4.something? This circuit is enough to feed op-amps. A few mAmps is good enough for small signals. You could try it by putting diferent resistance at the output, from bigger resistance to lower resistance. When the voltage drops, you hit your limit. To fix it, you must decrease the frequency of the oscillator (lowering C1), or increase output capacitance, C3 and C2. But this has a limit: with a bigger C3/C2, you could blow the 555 output. can i use this circuit if i want to obtain 20-30 volts for my op-amp ? and the two terminals of the input are positive and ground ? and what are the two terminals of the output ? , negative voltage and ground or something else ? What kind of diodes would you utilize for this circuit? If you are using the circuit with an Arduino, why do you need a 555? You can use a PWM output from the Arduino – it’s only a simple charge pump. Or any redimade modules with you..? We are looking for your reply..